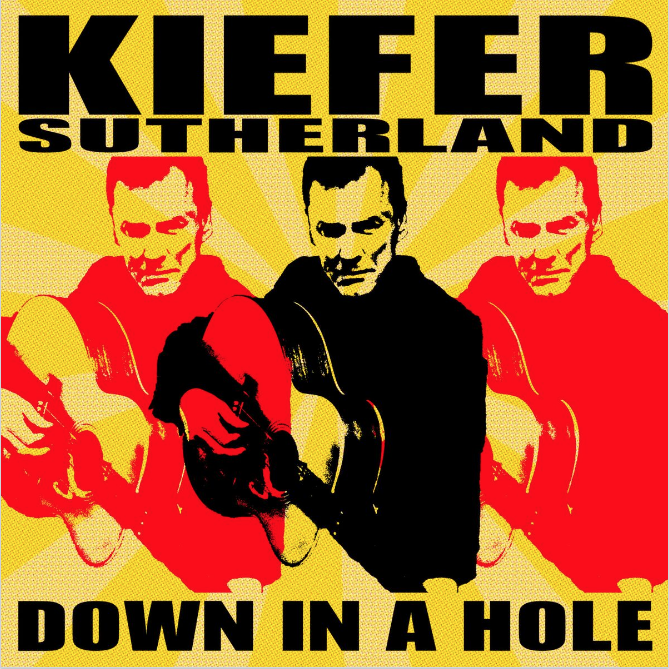 Whilst he is surely better known for his roles within US TV shows 24, Touch and Designated Survivor (amongst others) than his work within the music industry, Kiefer Sutherland released his debut country album Down In A Hole on August 19. The release of the album itself came as an intriguing surprise to many however upon researching this further I came across music within Kiefer's past (Down In A Hole having been released as a joint release between Warner Music Nashville and his own label Ironworks Music) and this longstanding link to music shows itself within this often pleasantly surprising album. One of the things that is immediately apparent is that this unapologetic album has an intriguing overall sound which unfortunately relies a little too heavily upon the electric guitar in my opinion. The weathered rawness to Kiefer's vocal is pleasantly surprising and in principle I like the idea behind the album but the novelty of the electric guitar does seem to wear thin through it's overuse. Nowhere is the rocky influence more evident than within Down In A Hole itself. The opening electric guitar hook hints at a fairly rocky track and once Kiefer's vocal enters this doesn't change. Ultimately it's a shame as, compared with the rest of the album, the almost shouted vocal and overpowering production quickly puts off listeners who aren't solidly fans of what is, in this instance, effectively rock music. Can't Stay Away is another instance where the listening experience becomes a little uncomfortable. Whilst the production does start off quite heavily it doesn't quite reach the same rocky level as tracks like Down In A Hole but the odd thing here is that Kiefer's vocal is at a level where it almost feels as though that alone is trying the pull everything along where it doesn't want to (or need to go). Admittedly the two thirty second long electric guitar solos don't help but it just feels a little like the track isn't sure whether it wants to be rock or gritty country. There are however some really promising moments within Down In A Hole such as third track, I'll Do Anything. The production of the track pulls the album more towards the country genre rather than the rock sound that is evident throughout most of the rest of the album and it works really well, just proving that Kiefer's vocal is actually strong enough to not have to hide behind the heavier rock instrumentalisation and it feels as though it is through songs like this that he will really draw people in. Lead single Not Enough Whiskey was the first song a lot of listeners would have heard of Kiefer's and it was a strong choice. The combination of the waltz timing and the distinctive grit behind Kiefer's vocal is not a combination that you would necessarily expect but it works very well. The inclusion of the pedal steel adds a mournful edge to the song which fits smoothly alongside the lyrics, contributing to the overall sound of a track which manages to be both mildly forlorn and a compelling listen. My Best Friend takes the listener on a musical journey as the number builds upon snippets from various different genres. It is also refreshing to hear just the right amount of electric guitar used, with the instrument pitched in such a way that it augments the track rather than feeling like the lead aspect of it. Whilst Down In A Hole isn't a perfect album it still holds echoes of promise. It would be nice to see Kiefer tone down the overall rock sound with any future releases and build upon the really appealing sound he showcases in the more typically country tracks that are also included here. He has an impressive vocal that should be flourishing rather than being masked. Even though I wasn't a fan of some of the overly rocky tracks, Kiefer should still be commended for a release that holds some really intriguingly strong moments.